3 Bedroom Detached House For Sale in Rotherham for Guide Price £185,000. GUIDE PRICE 185,000 - 195,000 OUTSTANDING FAMILY HOME! CONSERVATORY! Contemporary, impressive kitchen, Stylish bathroom, landscaped gardens, driveway and GARAGE! NO CHAIN! VIEW TODAY! New to the market is this spectacular three bedroom detached property on this sought after development in the popular residential area of Brampton Bierlow, close to amenities, local schools, transport links and easy access to an array of motorway networks. This fabulous house can only be truly appreciated on an internal viewing to get a real feel for the elegance, style and space the accommodation has to offer. 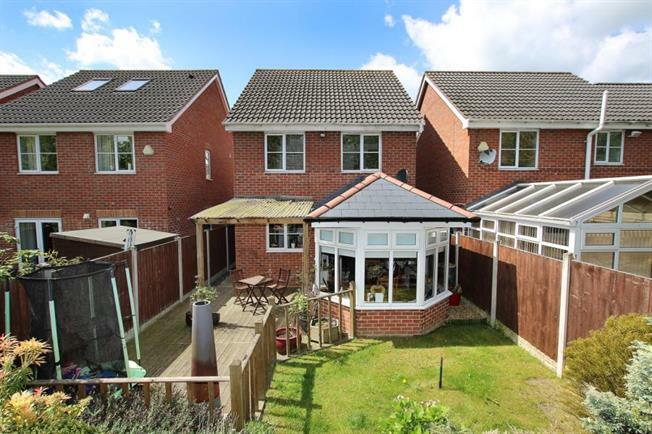 Briefly comprising; hallway, downstairs WC, recently fitted beautiful oak kitchen with integrated appliances, dining room, open plan living room, conservatory, three good size bedrooms, one en-suite shower room and a stylish family bathroom. The property offers- gas central heating, double glazing, spacious accommodation, parking on the driveway, a garage and a well maintained enclosed rear garden. Book your viewing to avoid missing out on this absolute treasure! !